There are just over two weeks left for local people to have their say on the draft plans for housing, employment, infrastructure and open spaces in Calderdale over the next 15 years. More than 1,500 comments have already been made on Calderdale’s initial draft Local Plan. However, the Council is urging more people to share their views before the consultation ends at 5pm on Friday, September 29. The council is also reminding people about the drop-in sessions and support available to help them to provide feedback. 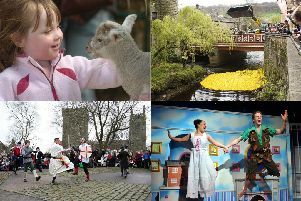 Coun Daniel Sutherland, Calderdale Council’s Cabinet member for Planning, Housing and Environment, said: “The Local Plan is about making Calderdale the best place it can be to live, work, visit, do business and invest. “We want people to have a good quality of life here, we want the local economy to thrive and we want to protect the environment. “To help ensure this, we need to know if the draft plans meet local people’s needs. That’s why it’s so important to have your say while there’s still time to help shape the future of the borough. The council says it is is making it as convenient as possible for people to have their say by providing a range of ways to make comments. These can be made online at www.calderdale.gov.uk/localplan or by emailing spatial.planning@calderdale.gov.uk or by writing to Spatial Planning Team, Town Hall, Crossley Street, Halifax, HX1 1UJ. Paper copies of the draft Local Plan are available to read in all Calderdale libraries and Customer First offices. A member of the council’s planning team is available to help you make comments online at the following drop-in advice sessions. The planning team is also on hand to answer any questions about the consultation process on weekdays during working hours on 01422 392206 or 01422 392381. If you’re visiting Halifax Piece Hall, head to the council’s information room on the upper level for a Local Plan leaflet and map. The draft plan will be reviewed based on the consultation results. Further evidence and a final draft will be presented to Cabinet and full Calderdale Council in due course.